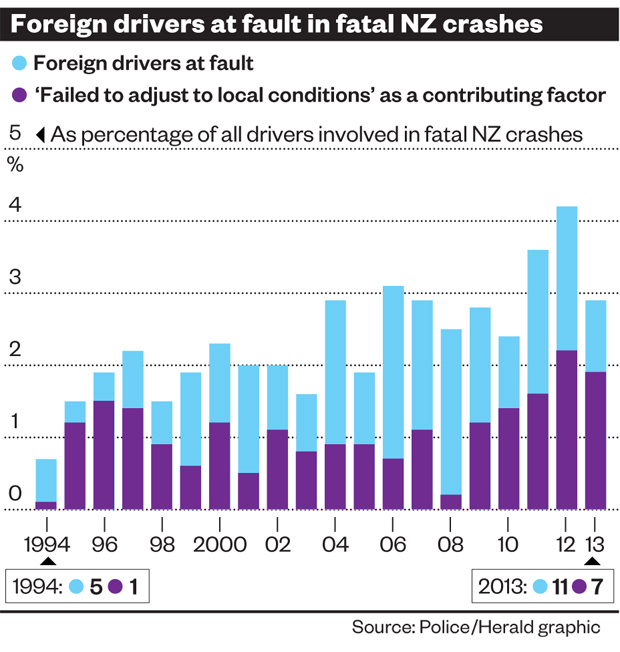 A lot of the crashes involving foreigners were consistent with errors made by Kiwi drivers. Overseas drivers were involved in at least 558 crashes that resulted in death or injury last year. In about three-quarters of the cases, the visitors were found at fault, including 11 crashes that were fatal. Seven of those were attributed to the drivers failing "to adjust to local conditions", according to crash data recorded at the scenes. Transport Agency safety spokeswoman Lisa Rossiter said a number of elements in New Zealand could cause "unfamiliar" drivers difficulty. "The unfamiliar driver is caught out by road design and layout they're not used to, and unfamiliar signage ... [and] they get distracted by scenery." Other factors could include failing to drive to speeds appropriate to New Zealand roads, or pulling out of rest areas on quiet roads into the wrong lane, Ms Rossiter added. However, a lot of the crashes involving foreigners were consistent with errors made by Kiwi drivers too. Over Queen's Birthday weekend, four people were killed by foreign drivers in two fatal crashes. Johannes Jacobus Appelman, 52, of Holland allegedly failed to stop at a stop sign at Rakaia in Canterbury on Saturday night. He has been charged over the resulting crash, which killed Abigail Hone, 12, her friend Ella Summerfield, 12, and Ella's mother Sally, 49. The previous night, on the Coromandel Peninsula, US tourist Cody Dickey crossed the centreline in his campervan, killing Aucklander Robyn Eilleen Derrick, a passenger in an oncoming four-wheel-drive. Dutch tourist Johannes Appelman (left) is charged with careless driving causing death, and American tourist Cody Dickey pleaded guilty to charges of careless driving causing death and careless driving causing injury. The crash figures, released by the Transport Agency, were sourced from the police Crash Analysis System, which is estimated to capture data on about two-thirds of injury crashes — meaning there may have been more than 800 overseas drivers involved in injury crashes last year. The 11 fatal crashes caused by them were down from a high of 17 in 2012. Ms Rossiter said the bottom of the South Island experienced more tourist-driver crashes than other areas, but work had begun in Central Otago relating to road safety and education under a Transport Agency "signature project" to decrease crashes involving foreign drivers. In the past 10 years, the highest percentage of fatal road crashes caused by visitors was just 4.2 per cent of the annual road toll, in 2012. Last year, that dropped to 2.9. However, the percentage has been slowly trending up over the past 20 years. In 1994, it was just 0.7 per cent. In the past week, road safety campaigner and Dog & Lemon car review editor Clive Matthew-Wilson suggested the Government needed to tighten the rules for tourists to get behind the wheel in New Zealand. He said travellers should be banned from renting cars until they passed an online driving test. But Prime Minister John Key does not believe laws need to be tightened. "If you look at the accident rate of tourists who come and drive in New Zealand versus New Zealanders themselves, it's pretty consistent. "They're about the same accident rate per capita. So I don't think that's a big issue ... [But] we do need to recognise that some of our roads are [on] quite difficult terrain for people who may be inexperienced drivers." Meanwhile, up to 1,000 mourners are expected at Abi Hone's funeral at Sumner School on Monday. Hone family spokesman Darren Wright said pupils would be given the option of remaining in class, going home or attending the funeral. "It's completely up to them," Mr Wright said. "The family wants to get as much support as they can." Abi and Ella both attended the school, and their families were integral in fundraising to build the hall where the funeral will be held. A large oak tree in the central playground has become a focal point for the grieving community, its trunk covered with cards, origami cranes, flowers, and balloons. Mr Wright said relatives and friends of the Hone family were arriving from all the world, including England and France. The support from them, and the wider community, was giving the Hones a "huge amount of strength". "There are a lot of people hurting over this," Mr Wright said. "It seems to have very much impacted people across Canterbury and NZ." It is unclear when the funerals for Ella and mum Sally will take place. Mrs Summerfield's husband, Shane, who was badly hurt in the crash and is still in Christchurch Hospital, is awake and talking but overwhelmed with grief, a family friend said. The extended family are taking the double loss "pretty bloody tough", said Wyn Mossman, Mr Summerfield's business partner. Last night, they released a short statement thanking the public, particularly the Sumner community, "for all their love and support".